Photos: Sunset Seasons Greetings (and Snow) in Hollywood Studios! One of the newest Christmas celebrations in Hollywood Studios is Sunset Seasons Greetings. 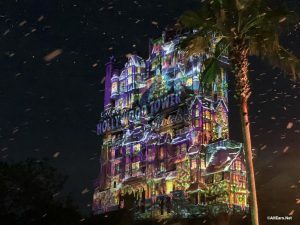 The celebration's highlight is the seasonal projections on the Tower of Terror. Plus, there's snow in Orlando. We've got photos of the decor, special effects, projections, and snow right here!